This adjustable-temperature soldering iron is a great tool for when you don't want to break the bank but need a reliable iron to get the job done. 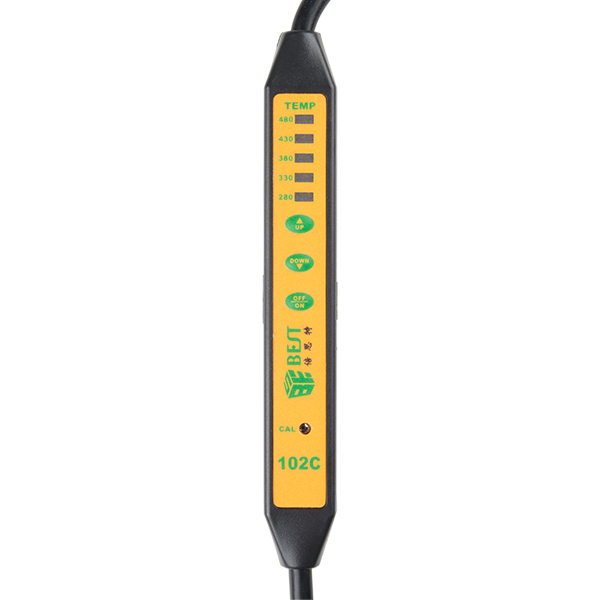 Operating at 60W and 110V, this soldering iron can be adjusted to five different temperatures: 280°C, 330°C, 380°C, 430°C and 480°C. This iron is very easy to use and features an on/off switch, allowing you to keep it plugged in on your workbench stand for quick access. 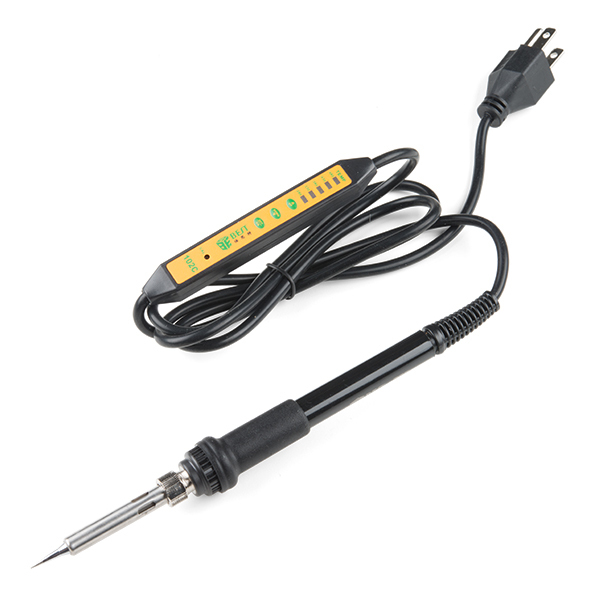 Each adjustable-temperature soldering iron is equipped with a 130cm (~51") power cord that is terminated with a North American standard type B plug. Additionally, the soldering tip can be replaced by simply unscrewing the metal cylinder (while COOL) to give your new iron plenty of different options! Hi, any chance for EU version (European 2-prong (CEE 7/7), 230VAC) ? Sorry, we've tried EU versions of things in the past because of requests, and they don't sell. I recommend checking out our distributor sites for a EU based distributor near you. They are likely to be an electronics distributor with their own selection of soldering irons. To be clear "adjustable" does not mean temperature controlled? Temperature controlled is a pretty important distinction. I hate to give you anything other than a confirmed answer but here we go: The cable certainly seems to be made of silicone. If it isn't made of silicone, it is very easy to manage and maneuver like it. Hopefully, this helps! Why such high temperatures? Only the bottom two temperatures seem useful for electronics soldering. Is this tool intended for jewelers doing silver soldering? The round body looks like a roll-off-the-bench burn waiting to happenâis there a stand with a cage sold separately? I have had several soldering irons in the past and one of it was even quite expensive. But all of them didnât work well like this one does. With this iron, i have done many great soldering for specially small component and PCB works. Donât understand why people give 4 stars. It is solid 5star iron. 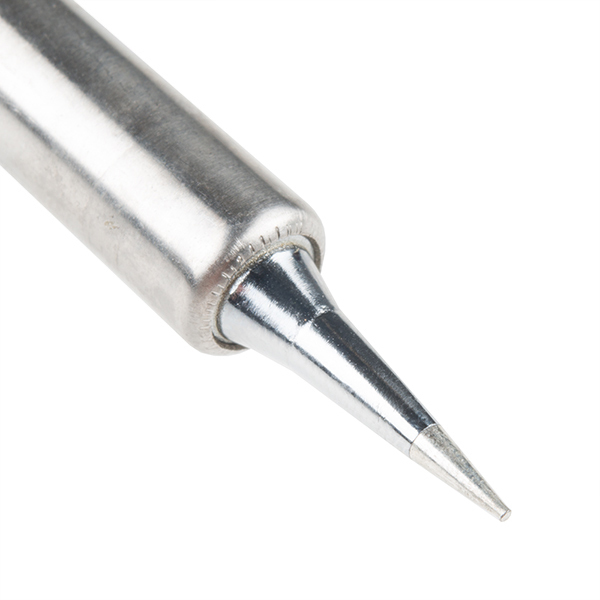 If you are looking for soldering iron, your search should end here. Just get this iron. Will not regret. Cable is flexible unlike other cheaper soldering iron and it makes it easier to use. Temperature control is nice little feature. Another big plus is that it is compatible with hakko tips. Wish Sparkfun had it several years ago. What I like: 1) Compact - I considered the Hakko soldering station, but I have very limited space on my workbench. This unit is much more compact and works well within the space I have. 2) Takes Hakko tips. This was a big selling point for me. Good quality tips are very important. I ordered the Hakko T18-D16 'chisel' tip with the iron. It's a terrific all-around general purpose tip. I've since ordered other Hakko T18 tips; all have worked well on this iron. 3) Heats quickly, temperature controlled. 4) On/Off button 5) Slim, fairly comfortable to hold, lightweight. The cord is quite flexible (in fact, feels like silicone... nice), not too stiff, easy to keep out of the way. What I don't like: Having the temp-controls on the power cord is a bit funky, and having them near the plug end of the cord can be inconvenient. The 'Up' temp button on mine is balky and doesn't engage as easily as it should. Conclusion: Overall, a great value for the price. I like it. This is a great soldering iron. The one I had from RadioShack was not cutting it. It would get too hot and unable to regulate which caused much damage to my proto boards! This iron has a much smaller tip ( I ordered the next size tip up) and adjustable temp Perfect every time! Highly recommended! What I was looking for a heat resistant flexible cord, and this actually seems like it, I tried burning the cord with my expensive soldering station set at 600F and it didn't get damaged at all. It is super flexible. But it does come apart really easily, it was easy to disassemble and examine the internal circuitry in the hand piece, and what I found was... nothing, like, there's actually no temperature sensor, so the "adjustable temperature" really means "adjustable power". If the control box fails, it can be easily bypassed but you'll end up with a super hot "max power" iron. It's also grounded. So, in comparison with other options at this price point (which are almost always not grounded), this one is a winner. I got this for a bunch of kids, hence why the the cord was important to me. Sometimes you get what you pay for. My iron showed up with a garbage tip that wouldn't take tin. After nearly destroying a circuit trying to make it work (I should've known better than to try), I went out and bought a new Hakko tip. After that, it does the job just fine. During use, the grip flirts with getting uncomfortably hot. If you need something portable and won't be doing a bunch of work with it, though, this iron is a fine option. Sorry to hear about the bad tip! We haven't had any complaints about that so I think it's probably an isolated incident but if you have any questions just contact our technical assistance team and they will be happy to assist. Soldering Iron - 60W (Adjustable Temperature) The iron is worth the price and works great for my portable fix it bag, The adjustable Temp for a portable Iron..Ideal for my purposes. I like the temperature control and good price. The grip is nice and well insulated. Overall I am pleased. I had one minor problem after only using a few times -- the unit would not change the selected temperature. I was going to return it when it starting working properly. So far it hasn't failed again. I ordered a set of additional tips (eBay). I would buy again.